Birding Is Fun! : September 25 is Black-backed Woodpecker Day! Nemesis stories are birding’s equivalent of the Norse saga, passed down from birder to birder in the great oral tradition at the tribal gatherings at High Island, Whitefish Point, and Madera Canyon. The saga’s hero must overcome insurmountable odds, traveling great distances and suffering grievous disappointment and hardship. He is guided only by the words of a sacred tome written by the mysterious wizard Sibley. Along the way he meets strange and diverse characters that aid the quest. 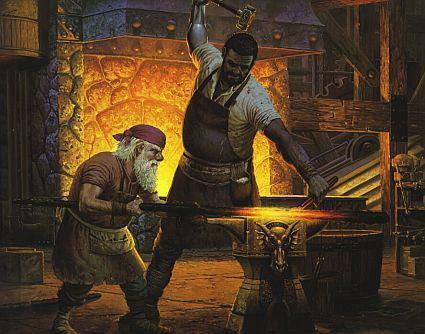 The hero carries a magical sword forged by a shadowy dwarf named Swarovski. In the end, he prevails and slays his nemesis. Or he dies trying. I’m still alive, so that may be a spoiler with respect to how my nemesis story ends. Still, I feel the need to share, this being near the first anniversary of the Great Victory. The story is not short. Pulled from my shelf. Right is original 1939 woodpecker volume from Arthur Cleveland Bent's Life Histories series. Woodpeckers have always fascinated me. I grew up seeing plenty of them in our feeders in rural western Pennsylvania, but I wasn’t a birder then. Pileated Woodpeckers caught my attention then (and still do), but somehow they never sparked me to become a birder. By the time I actually took up birding as a hobby (read: life-consuming passion/addiction) I was living in Michigan and had accumulated several bird books, including Lone Pine’s guide Birds of Michigan. Leafing through that book, I devoured all of the fascinating natural history tidbits the Lone Pine guides are noted for. I’d seen about 30 of the 300+ birds in the book, so almost every one of them was a future lifer that I couldn’t wait to see. One bird’s account struck a chord with me, and I decided I absolutely had to make it a priority to see a Black-backed Woodpecker. (You see where this is going, right?) I never realized there were odd woodpeckers like this creature. It didn’t even have any red on it! As a naturalist and ecologist (by a little bit of training and much practice), plants and animals catch my attention not so much with a flashy appearance but a nifty (and preferably specialized) ecological behavior. 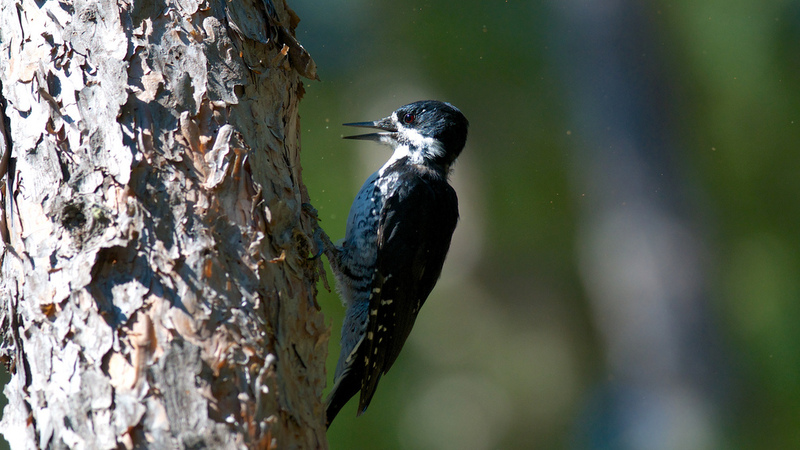 Black-backed Woodpeckers fit that bill. 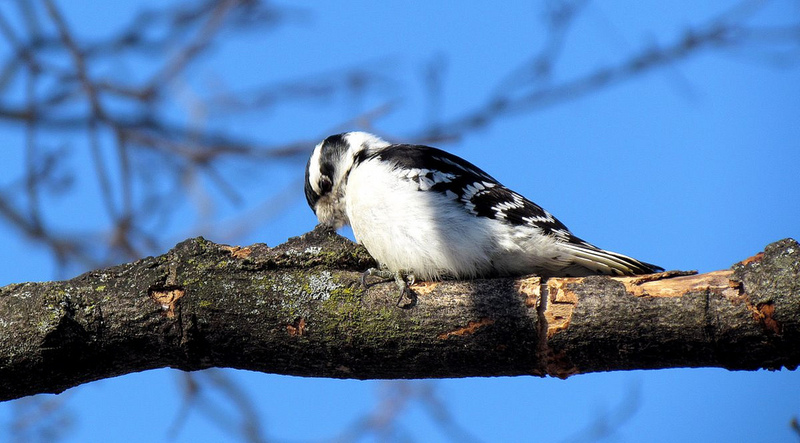 They like to eat wood-boring beetles, which they get to by chiseling off slivers of bark from a tree trunk. They hammer away for a few seconds, disdainfully flick aside a chunk of bark, and lap up the exposed grubs. The beetles like freshly burned trees, and hence the woodpeckers spend a lot of time on burned trunks. And therein lies the genius of having a charcoal black back. The whole thing is such a beautiful lesson in ecology and evolution, I smile just thinking about it. So, I was a birder now and I was going to go out and see a Black-backed Woodpecker because Black-backed Woodpeckers are awesome. Since I lived in Michigan, arguably one of the best states for finding the things, the quest would be simple. Then I walked out into the woods…also known as the real world. Several trips to the Upper Peninsula yielded no Black-backeds. That was disappointing, but OK. I was learning birding skills and paying my dues. Every time I stepped out of the house I was a better birder than the trip before. I started finding lots of birds and recognizing more on sight. I got to the point where I no longer needed to ask “Downy or Hairy”, because it was obvious to my practiced eye. But those were the only members of the exalted Picoides genus I was seeing. This Downy Woodpecker helped me look for a Black-backed, but found none in that hole. Then came a road trip to Newfoundland. Black-backed Woodpeckers reside on the island of Newfoundland. 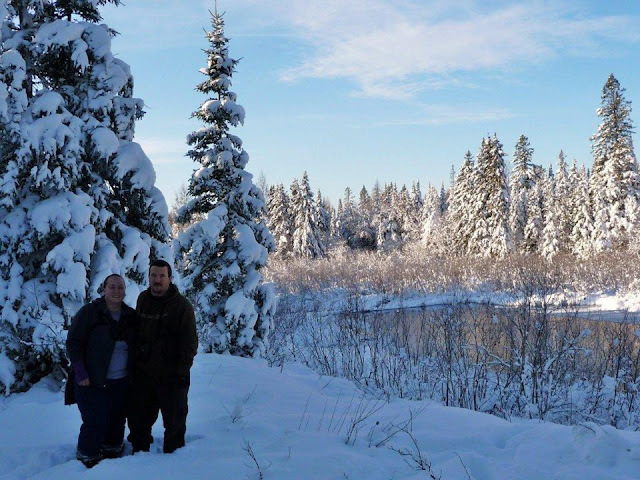 I got my lifer Gray Jay and Boreal Chickadee in the boreal forests of Terra Nova National Park. I looked and listened for P. arcticus to no avail. 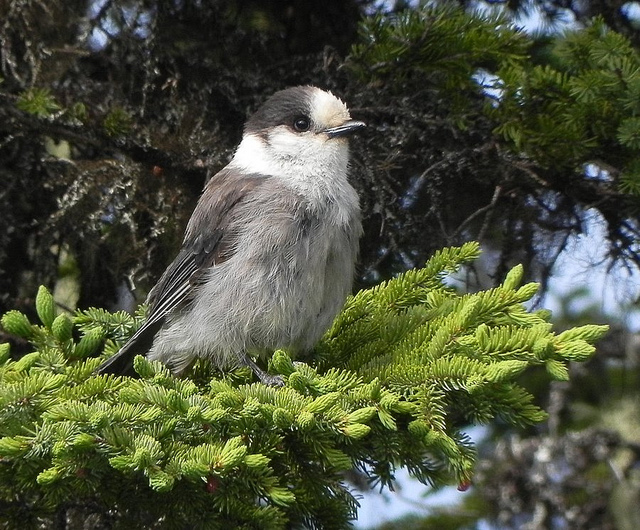 Not a woodpecker at all, but a Gray Jay is a fine consolation prize. Sarah and I became so enamored of Newfoundland, we returned the following summer. This time I was armed with reports of breeding Black-backeds in Cape Breton Highlands National Park in Nova Scotia. We penciled in a couple days of exploration in Nova Scotia on the trip back from Newfoundland. I found some amazing forests in the Grand Anse Valley, but no woodpeckers. Two years after the start of the quest, I found myself living briefly not in southern Michigan, but the northern reaches of the “mitten” part of the state. Black-backeds are an Upper Peninsula bird, but they aren’t unheard of in the northern mitten, and now I had time and access to explore all of the areas that had been burned in the past few years. 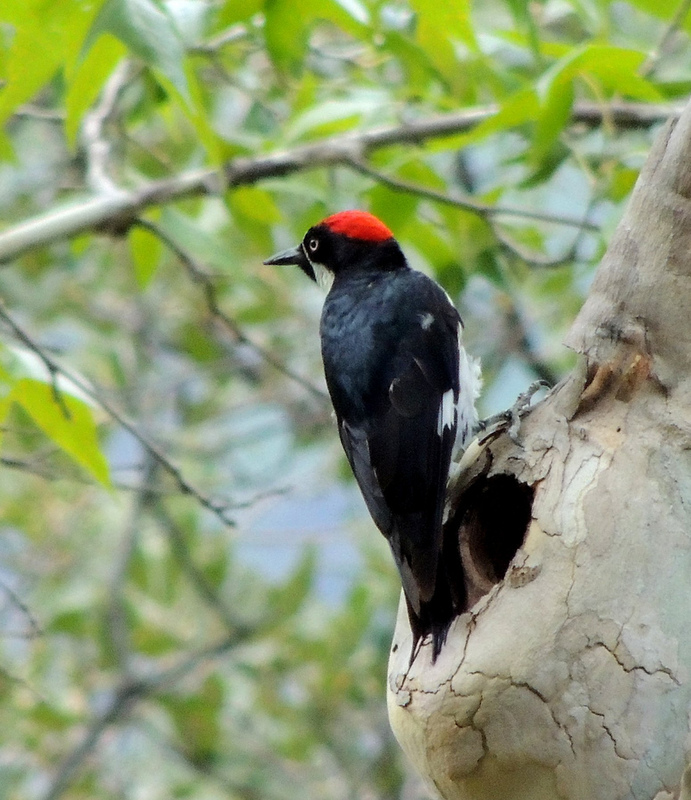 Surely I’d finally see my beloved woodpecker. No such luck. I was starting to become a decent birder, though. November found me in the woods on the morning of the first big snow of the year in the UP. I was on the Peshekee Grade, an old railroad bed-turned-to-raod through a sub-boreal stand of deep, dark forest west of Marquette, Michigan. The stars were aligning because I had legendary Upper Peninsula birder Skye Haas and some other seasoned searchers with me. Our small group walked a bit on the North Country Trail through untrodden knee-deep snow. It was one of the most peacefully beautiful hikes I’ve ever taken. Flocks of Common Redpolls passed over and Boreal Chickadees chattered through the spruce. Returning to the road, Skye had somehow emerged without his glasses. He returned to the trail with one other birder to the spot he thought he’d lost them. The rest of us decided to drive our cars a couple miles ahead to do some road-walking from there. Sarah and I on that morning in the Peshekee Grade. 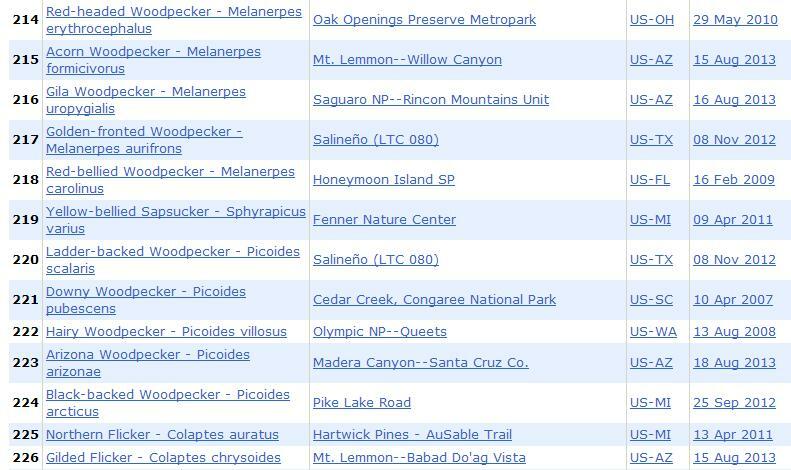 Notice the lack of Black-backed Woodpeckers. We found our spot and had some friendly Gray Jays visit us. After a while, Skye pulled up and reported casually, “Had a Black-backed at the bridge right back there.” I nearly jumped for joy at this news and left the group shortly thereafter to check the bridge. The woods were lovely, dark, and deep, but…there was not a hint of a woodpecker. Skye had heard or seen one in this spot twenty minutes earlier and now there was nothing. If I had stayed to help him hunt for his glasses, as I was thinking about doing, I would have had the bird. I don’t bestow the mantle of “Nemesis” lightly, but at that moment the Black-backed Woodpecker finally met all the criteria. I had wanted it for years. I had made many trips especially searching for that particular bird. I was in areas known to have the bird. And now, finally, I had the last requirement: a near miss. This IS a Black-backed Woodpecker, taken by another legendary UP birder, J.D. Phillips on the Peshekee Grade. 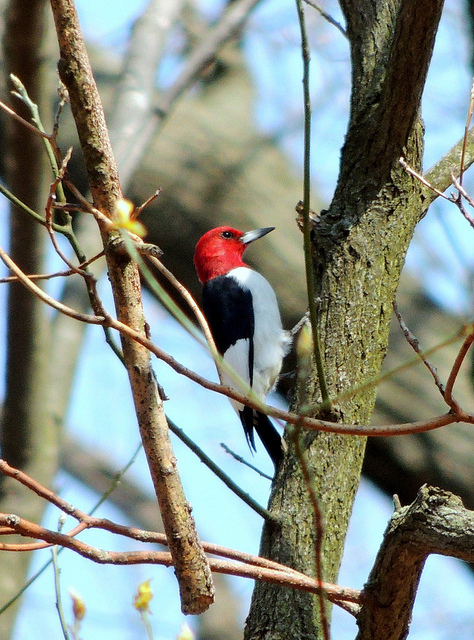 After a winter full of Snowy Owls, spring sprung and I felt good about birding in 2012. In May, the eastern UP caught on fire. The Duck Lake fire badly burned 21,000 acres of forest. That’s small by western standards, but a hulking fire in Michigan. We returned from a birding excursion in North Dakota that June to search again for the Black-backed Woodpecker. We tried a known breeding area where they’d been reported at a two-year-old burned area south of the Duck Lake fire. No luck. I looked at his Ohio license plates, thinking about the long trip he’d made hunting this bird. “We’re the wrong two people to run into each other out here in the middle of the wilderness” was all I could say. We parted with wishes of good luck in the hunt, but I had no woodpecker luck on that trip. 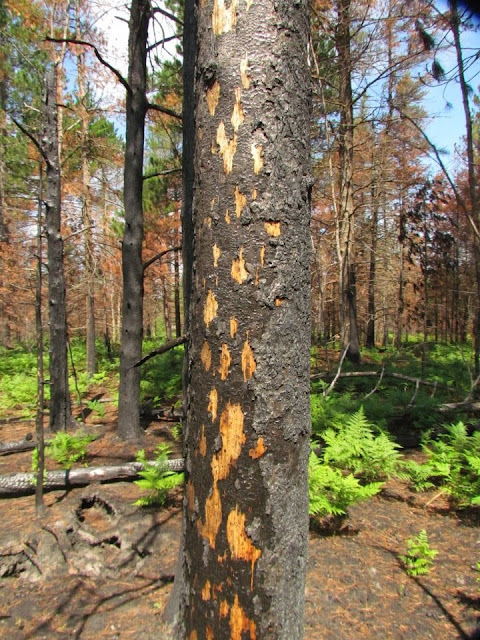 A promising sign, two months after the Duck Lake burn. September arrived. The annual pilgrimage to Whitefish Point to marvel at flocks of grebes and loons was on my agenda. On the way, Sarah and I planned to once again scour the Duck Lake burn. We stopped atop a small rise overlooking a heavily scorched area. Salvage logging was going on not too far away, the sound of the equipment clear in the air. Then there was drumming. I was certain it was my bird. I’m familiar enough with the drumming of the other seven woodpeckers I commonly see in Michigan to recognize this one was different. I grabbed the iPod and played Black-backed Woodpecker drumming to myself beside the car, louder than I intended in my excitement. The woodpecker responded, perhaps to my playback, with an identical drum beat. The last thing I wanted to do was disturb the birds, no matter how badly I wanted to see one, so I put the pod away and stood. Sarah and I heard it drum a few more times in the distance, then not again. I was afraid to move, every step being so loud and obnoxious on this terrain. I tried to take one step forward with my now-elevated heart rate and broke an unseen twig with a hideous snap. Then I saw movement as a charcoal black bird flew up to a tree trunk 20 feet in front of me. 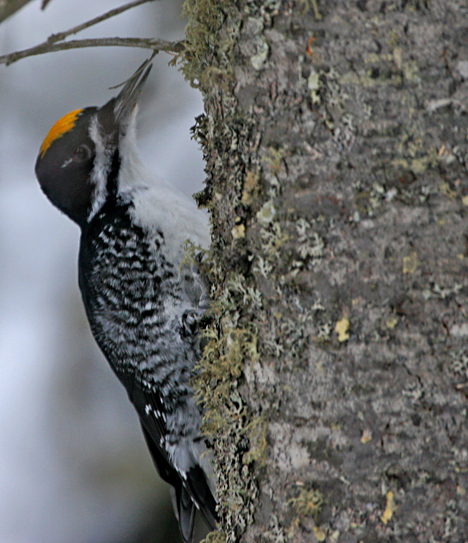 The female Black-backed Woodpecker poked at the bark, hammered it briefly and started flicking off shreds. She gorged on some beetle grubs, flicked some more burned bark, took a glance at me and flew off through the blackened trunks, disappearing over the next rise. Four years after reading about it, I had gone out and found the bird. I never touched my binoculars or camera, just drank in the bird with my own eyes for 20 or 30 seconds. Sarah walked back toward me with a big grin, congratulating me on getting the bird. All I could think to say was, “She was flicking off pieces bark,” as if to confirm that what it says in the books is true. But when I tried to talk my voice broke and I knew I was going to burst into tears if I tried to speak at that moment. So, yeah, I got teary-eyed over a woodpecker in a burned out woods on an otherwise non-descript September morning. If you don’t get that, then I don’t know what I could do to explain it. If it makes perfect sense to you, then let’s go birding. 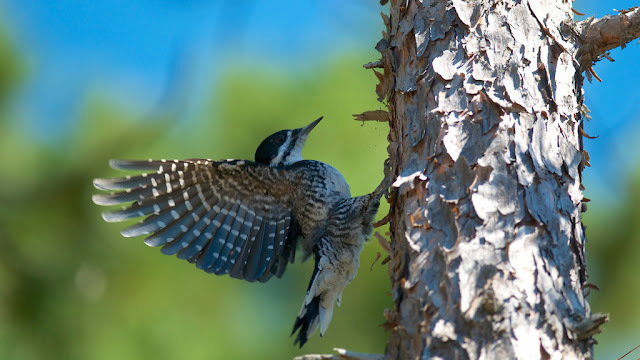 Stunning shot of a female Black-backed Woodpecker by Perry Allen. And another from Perry Allen. What a gorgeous shot of an amazing bird! 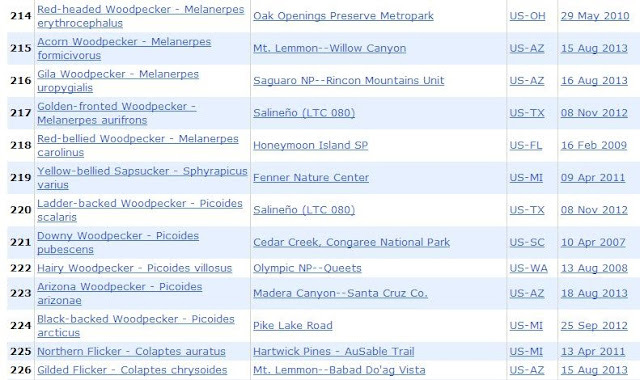 Thanks to going back and entering old lists, I have some diverse locations in eBird for my lifer woodpeckers. September 25, 2012 is still the one that means the most, though. An enthralling read! Well done on finally achieving seeing the bird. I'm hoping to see some - any - woodpeckers next year as we don't have them in Australia. Indeed, an oversight on Australia's part. Then again, in looking through all the other wonders in the Australia field guide, it's hard to feel TOO sorry for you! What a great story and told very well. Loved it! That place is spectacular, and a sure-thing for Red-headeds!